Sean Hannity aka Sean Patrick Hannity is an American talk show, host, author, and conservative political commentator. 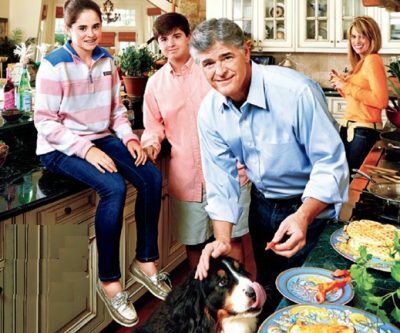 He is well-known as the host of The Sean Hannity Show and cable news show, Hannity. Sean earns the good sum of money in his career. Being an American talk show host, author, and conservative political commentator, he has several sources of income. In the year 2003, he bought a home in Huntington, New York worth of $3,450,000. He signed 5-year extension deal of $25 million with Citadel Communications in 2004 and signed $100 million in 2007. In 2013, Sean Hannity helped in raising more than $9 million by hosting freedom concerts to raise money for charities. He earns $30 million as annual salary and used to live in $3.6 million house in Harbor, New York. Currently, he is living on Centre Island, New York and has the net worth of $80 million. Sean Hannity is married to his long-term girlfriend, Jill Rhodes in 1993. The couple has a son, Patrick Hannity and a daughter, Merri Kelly Hannity. The couple is enjoying their married life and living together along with their children in Long Island, New York. Sean Hannity earned wide recognition and fame for his outstanding work. He received a Marconi Award as the Network Syndicated Personality of the Year from the National Association of Broadcasters. He was also listed as 2nd out of 100 most important radio talk show host in American by Talkers Magazine and gave him Freedom of Speech Award. Moreover, he was also honored with the National Talk show Host of the Year Award for three consecutive years by Radio and Records magazine. Additionally, Former Fox News guest Debbie Schlussel claims that Sean Hannity sexually harassed her and called her in his hotel room. Later, Sean told that it is false and a complete fabrication. Sean Hannity was born on 30th December 1961 in New York. He was born to Hugh J. Hannity and Lillian F. Hannity. And grew up along with his siblings. His grandparents immigrated to the United States from Ireland and he grew up in Franklin Square, New York. Hannity attended Sacred Heart Seminary in Hempstead, New York, and St. Pius X Preparatory Seminary high school in Uniondale, New York. He dropped out from New York University and Adelphi University. Sean worked as a general contractor and volunteer talk show host before joining WVNN in Athens, Alabama and WGST in Atlanta in 1990. Later in 1996, he was hired by Fox channel and become a co-host of Hannity & Colmes show featuring Hannity and Alan Colmes. He also began a new Sunday night television show Hannity's America on Fox News. Besides his radio and tv career, Sean is also an author. He has published three books till now which includes Let Freedom Ring: Winning the War of Liberty over Liberalism in 2002, Deliver US from Evil: Defeating Terrorism, Despotism, and Liberalism in 2004. His third book Conservative Victory: Defeating Obama's Radical Agenda, Harper Paperbacks in 2010, which became Hannity's third New York Times Bestseller.